When the air outside is freezing and winter is dragging on, there's nothing better than a hot bowl of soup to warm you up. Try making your own homemade soup with a little help from your performance blender, which can chop, puree and even reheat soup so that you can enjoy it as a leftover. Consider one of these hearty, tasty soup recipes this winter. Butternut squash is loaded with vitamin A, vitamin C and fiber, according to the U.S. Department of Agriculture. Plus this vegetable is seasonal in the winter, so you won't have trouble finding plenty for this rich soup. Start off by gathering and preparing your ingredients. Cook the cubes of squash for about 10 minutes in a 400-degree oven on a basking sheet until soft. While the squash is cooking, brown your onion on the stove with olive oil. Add broth and apple to the onion and oil, season with salt and bring to a boil. Reduce the heat and cover the saucepan, then add the squash when ready and simmer for about 5 minutes. Take off heat and transfer it into your performance blender jar. Blend on MEDIUM then move to HIGH until you have a fine puree. Depending on how much soup you're making you may need to do batches. Return the soup to a saucepan, add the remaining spices as desired. Heat slightly and add 2 tablespoons of half and half, stir then serve. 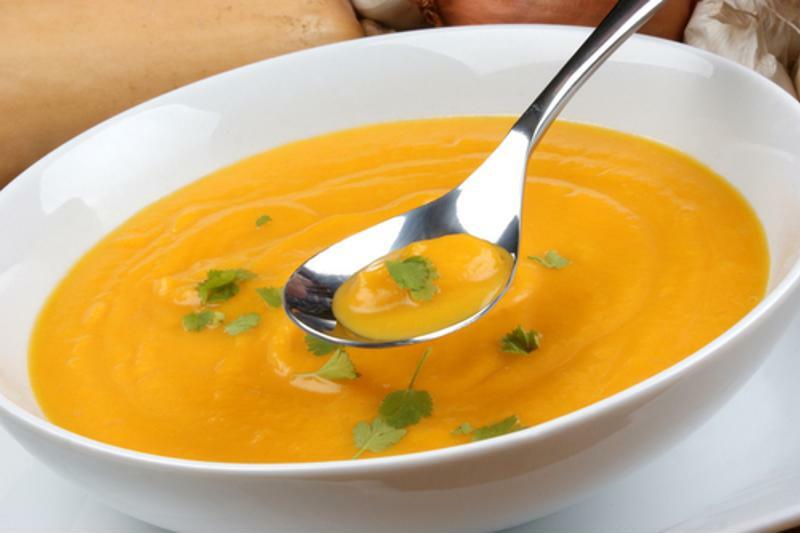 Make a big batch of butternut squash soup to last you for a week. Take your chopped vegetables, butter, broth and spices and place them in your Crock-Pot® brand slow cooker on medium to high heat for 4 hours. When they're soft, pour your mixture into the performance blender and blend on HIGH, with the lid cap open for steam to release. Then take your pureed mix and put it back into the slow cooker. Add cheese and any additional spices, as well as extra broth or water and cook until you're happy with the flavor and consistency.